Kodi is free, open-source media player software. It was developed by the XBMC Foundation, as the software was originally named Xbox Media Center or XBMC. Now the software's name has been changed to Kodi. 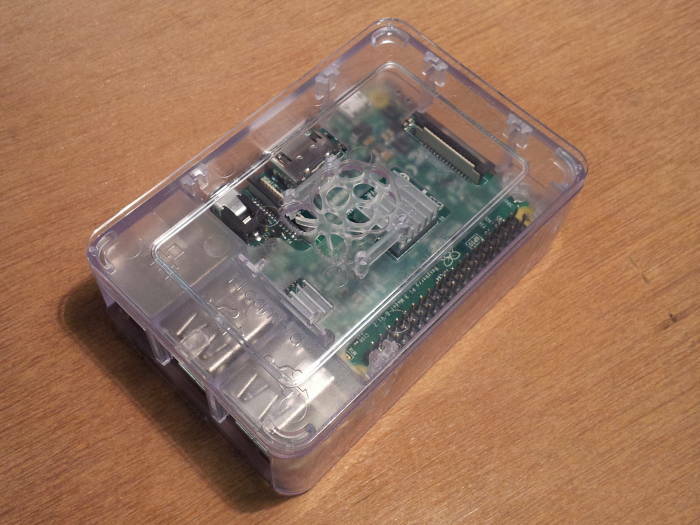 Raspberry Pi is a physically small, low-cost, low-power computer. The single-board computer itself retails for US$ 30-35, you also need a microSD memory card, a smart phone charger, and an HDMI cable. The total cost is about like one month's basic cable bill. These are my notes from just starting to experiment with Kodi / OSMC / Linux / Raspberry Pi. Let's start at the bottom, with the hardware, and work our way up. 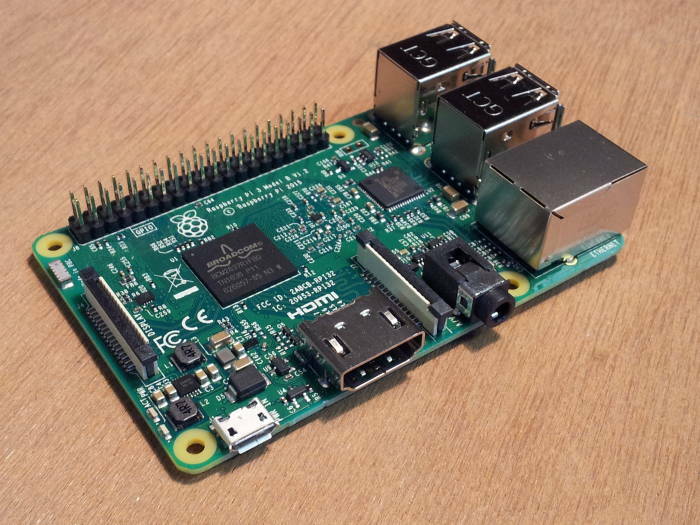 This is a Raspberry Pi 3 that I used for this project, as opposed to the model 1 shown in the banner at the top of the page. 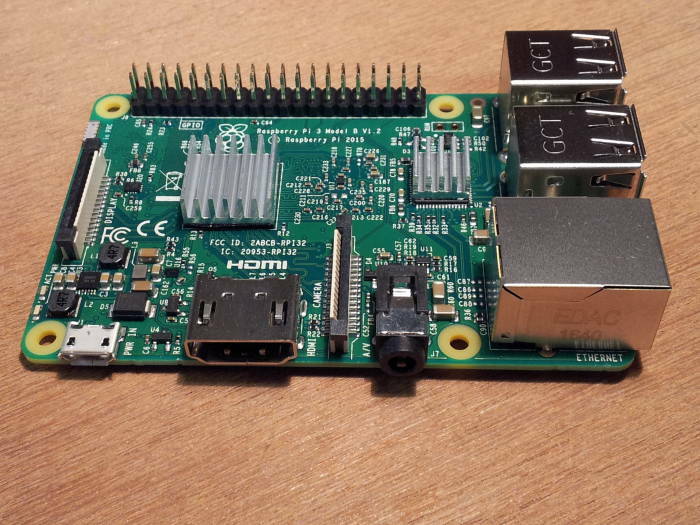 A Raspberry Pi 1 does not have a fast enough CPU. Its single 850 MHz CPU core frequently goes over 95% utilization, and playback of a DVD ISO image hesitates frequently. 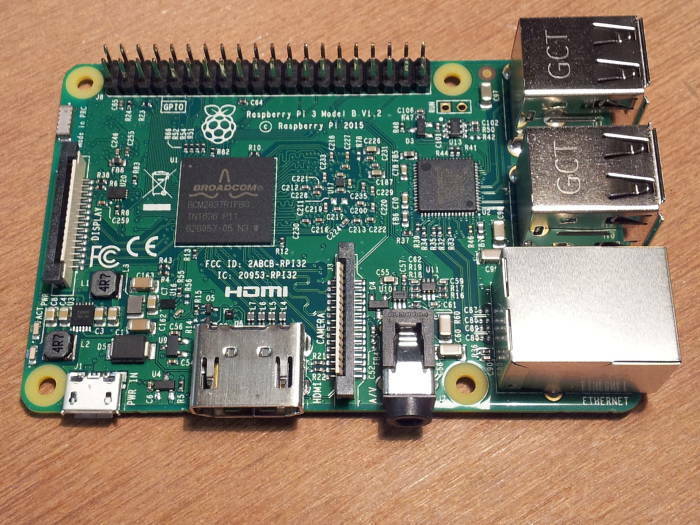 A Raspberry Pi 3 has a 1200 MHz CPU clock. The kodi.bin program runs on a single core. The 850 MHz ARMv6 CPU is not fast enough, one core of a 1200 MHz ARMv7 has plenty of speed. 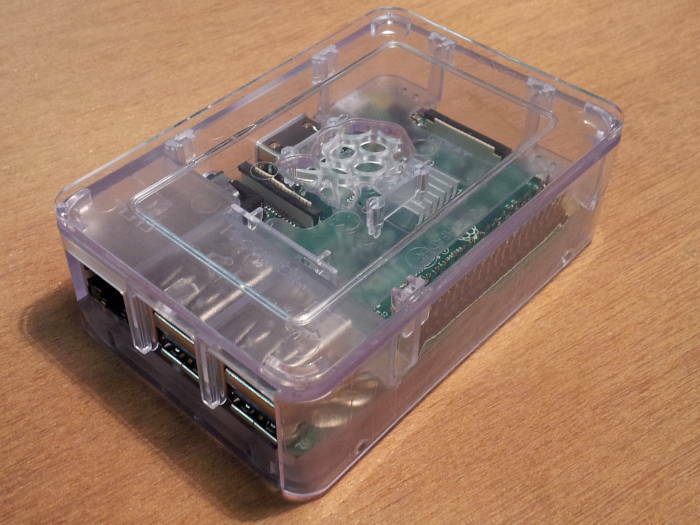 Raspberry Pi 3 peripherals include a 10/100 Mbps Ethernet port, four USB 2.0 ports, HDMI, a composite audio/video output, and 17 general-purpose input/output lines. The SoC and the chip with the USB and Ethernet controllers can run pretty hot, so CanaKit bundles a Raspberry Pi 3 with two small heatsinks, a 2500 mA power supply, and a clear case. You will also need a microSD memory card, a USB keyboard, and an HDMI cable. I found a 25-foot Amazon house-brand HDMI cable that was much less per foot than an HDMI cable from Walmart. 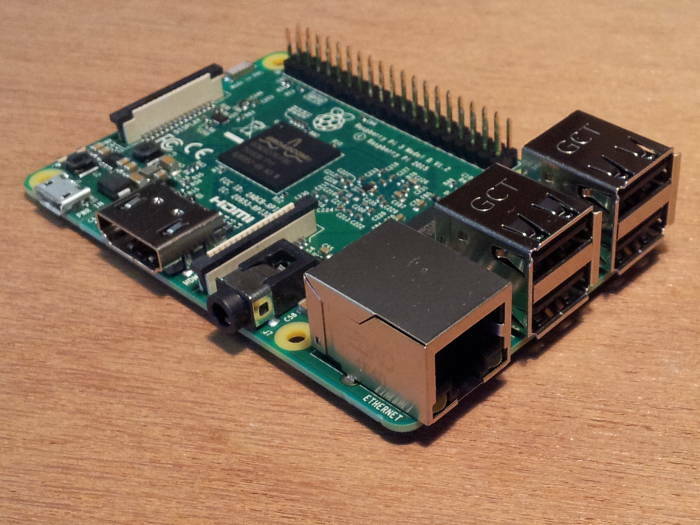 Debian derivatives of Linux like Raspbian are the most common operating system on Raspberry Pi platforms. Others exist, see my project to run Active Directory with Samba on the FreeBSD operating system. OSMC has been optimized to boot very quickly. Its graphical interface is up and running within a few seconds. I downloaded OSMC from the main site. It comes down as a gzip-compressed file which expands to 256 MB. List your storage devices /dev/sd* and then plug in a card reader with your microSD card. Then list the devices /dev/sd* again and see which disk is new. I did this on a system with a lot of storage, disks /dev/sda through sdf, so the new disk was sdg with its partition sdg1. Be very careful to determine which disk device is the newly added microSD one, as an error here can wipe out all of your data. Change the image file name and the device sdX in the following as needed. Plug in an Ethernet cable and its power supply, and let it boot up. Now you're ready to explore Kodi! The interface is pretty intuitive. A mouse isn't needed, one can't even be used. Navigation is with the arrow keys on the keyboard, <Enter> selects the highlighted item, <Escape> backs up one level or returns to the top. Remember that .. takes you up one level, the same as in most any computer operating system. It walks you through some basic setup the first time. You can go back through the Settings menu to change things. – and + to decrease and increase the volume. I have just started to look through some of the many add-ons that come with Kodi. Some of this is really arcane, like VimCasts, "Screencasts about Vim, the text editor". Cinepub.ro has some Romanian films. Or at least it's a Romanian site with some movies. Comet TV Live works, seems to be what's carried as a secondary channel on some terrestrial broadcast and picked up on cable. MeTV works, it's an archive of old TV shows. MyTV.bg (Bulgarian) needs an account. NASA TV works. It has NASA live programming, and a live feed looking down from the International Space Station. NHK Newsline works, it has English-language 30-minute news programs about Japan. PBS Think TV lists a lot of shows, but all that I tried took me to choices of 0 Episodes, 0 Clips, and 0 Previews. RTK has live streams of TV from Kosovo. RTK 1 is Balkan sitcoms, news, and other programming. RTK 2 is music videos at times, documentaries at other times. RTK 3 has been down most of the times I have tried. RTK 4 is music videos. Wikipedia's explanation of Radio Television of Kosovo says that RTK 2 focuses on minorities, RTK 3 is a news channel, and RTK 4 is arts and documentaries. Some of the music is like Eurovision, some is a guy in a fez playing an oud. You see, the fez was outlawed in the Republic of Turkey, but it lives on in parts of the former Ottoman Empire. RTS - Emissions TV (French) works. Smithsonian Channel works, it has an archive of 80 or so documentaries. SyFy has episodes of programs created for that network. TV Viet Nam has some Vietnam Television channels — VTV1, VTV2, VTV3, VTV4, VTV6, and VTV9 plus several other Vietnamese channels, 21 in total. The FOX station is a little fuzzy with some artifacts, but it's not bad at all. The others are quite good. WABC, WCBS, and WNBC all work, they are the New York broadcast stations of the three major networks. All have about 75-100 shows. Some are current shows with their most recent 5 episodes, some are older shows going back at least to the mid 1980s, to the 1960s in a few cases. Most of the older ones are something like the first 5 to 10 episodes of the first season. An exception is WNBC and Miami Vice, which has 111 episodes from Season 1 / Episode 1 (09/16/1984) through Season 5 / Episode 22 (01/25/1990), all but one episode according to Wikipedia. Several Kodi add-ons are archived at comparitech.com. This page says that you can put one of those zip files in ~osmc and then install it by going through the menus: System → Settings → Add-ons and then selecting Install from zip file. The CPU is detected as an ARMv7 because the provided kernel only supports 32-bit mode. With a 64-bit kernel, it would be detected as an ARMv8. I think this is because of the entries shown below from /boot/config-4.4.27-7-osmc. Run ip neigh on the DHCP server to find its assigned IP address and MAC address. I modified /etc/dhcpd.conf on the server to assign it a specific IP address, modified the DNS server to associate a hostname with that IP address, and reloaded the DHCP and DNS servers. Then I restarted the Raspberry Pi, and it came up with a known IP address I could refer to by name. Connect in over SSH. The user name is osmc with a password of osmc. The user osmc can use sudo bash to get an interactive session as root. OSMC's design is focused on graphical use. It lacks basic command-line tools like file, tree, bc, and vim (although of course vi is there). But you can easily add any Debian packages with apt. The system settings are saved under ~osmc/.kodi/ with subdirectories addons, media, system, temp, and userdata. The Add-ons specify streams from the Internet. Each add-on creates a hierarchy under ~osmc/.kodi/addons/, like this one for the Smithsonian Channel. An XML file defines the stream itself. My Comcast connection provides about 22 Mbps down and 5.7 Mbps up. HD streams like Agents of Shield from WABC take about 3.0-4.5 Mbps, about 14-20% of my download bandwidth. Something like a mid-1980s Miami Vice episode streamed from WNBC takes about half of that. Lo-fi RTK video, even less. 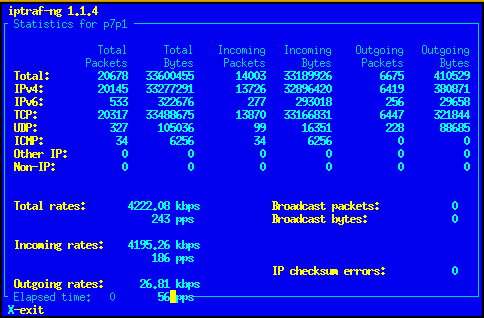 iptraf-ng showing traffic rate on exterior interface of network gateway while streaming a current HD program from WABC. The kodi.bin process listens on TCP port 8080 with a web-based interface like what you have on your HDMI-connected TV. Point your browser to http://kodi:8080/, or its IP address if you don't have DNS set up. The CPU load isn't bad at all. Here's a snapshot taken while playing an HD stream. The Kodi program is using about 23% of one CPU core. For a mid-1980s TV episode the CPU use drops to about 15.3%. Remember that this is a four-core CPU, so this is only about 23% of one of the four cores, under 6% of total CPU resources. The other three CPU cores are almost completely idle. I added a line, highlighted in yellow below, to automount an NFS share with video files. This does not automatically mount the file system at boot time, as OSMC will come up much faster than the server. It automatically mounts the file system when you try to access it. myserver:/home/video The NFS server is myserver, it is exporting or sharing its /home/video area of its file system. /home/osmc/video That shared file system is connected as /home/osmc/video. Create an empty directory by that name. ro Mount the shared file read-only. noatime Don't update access times in the file system. This improves performance, as has already been done for the root file system. However, notice that we did not specify this for the NFS mount, as the Linux NFS client by default does not update file and directory access times. We could include noatime,nodiratime but that would have no effect. See man nfs for details. noauto Don't automatically mount this at boot time. x-systemd.automount Get systemd to automatically mount this when needed. It will probably take a reboot for systemd to pick this up. 0 0 Don't make backups, and don't run fsck. Now we can test the mounting. Notice that by default it uses NFSv4 over TCP with 1 MB read and write requests, the maximum size. So, it's already tuned for performance at the NFS layer. Let's say that you make a copy of a DVD that you own, so you can take the copy on a trip without worrying about losing or damaging the original. You cannot always play the resulting DVD media in a player. For some titles, after 20 minutes the audio mutes and an on-screen message appears. This is because of the Cinavia steganography and analog watermarking used on some DVDs. Firmware support for Cinavia became mandatory for Blu-ray players in 2012. The copied disk will lack the AACS or Advanced Access Content System key stored within the Volume ID and not copied when duplicating the disk content. While the Cinavia/AACS combination was done to prevent Blu-ray copying, the technology is used in some DVDs. Kodi can play an ISO image of a DVD, but it will not detect the Cinavia steganographic watermarking. So, it plays images you can't burn onto optical media and play.